Dan practices physical therapy at the UW Health Sports Rehabilitation Clinic and specializes in the treatment of patients suffering from lower extremity injuries and surgeries, particularly ACL and meniscus injuries. Dan is a member of the Wisconsin Physical Therapy Association, the American Physical Therapy Association, and the American College of Sports Medicine. He is a certified strength and conditioning specialist through the National Strength and Conditioning Association. Dan is licensed by the state of Wisconsin to practice physical therapy and sees patients upon referral. 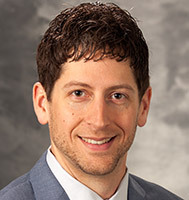 Dan holds a Bachelor of Science degree in Biology and Kinesiology from UW-Madison, a Doctor of Physical Therapy degree from UW-Madison, and a PhD in Rehabilitation Science from The University of Iowa. He is a faculty member of the UW-Madison Doctor of Physical Therapy program. Dr. Cobian is a research scientist with the Badger Athletic Performance group and the Neuromuscular Biomechanics Lab. The objectives of his current research are to better understand the neuromuscular implications of knee joint trauma, characterize the effects of knee injury on movement biomechanics, sports performance and function, and determine how to best prescribe and dose rehabilitation interventions to facilitate improved outcomes and long term quality of life.